My digestive system is finally back on track. Things are looking up and my mood has been really positive! I’m going through some big changes in my life: the FODMAP commitment/diet, another new year at work (I work at a university, so each fall is a new year), and I’m going back to school in the winter. I contemplated continuing my education way before FODMAP, and my new lifestyle changes just fueled my desire to build onto my knowledge and degrees. I’ll be starting a post-bacc program in integrative holistic health and wellness, and I’m really excited. Not only will this build upon my present degree (counseling), it will expand my career opportunities and possibilities. I’m really looking forward to learning more about nutrition counseling, wellness coaching, and other holistic methods for total health and wellness. After going low-FODMAP, I really, really REALLY wanted to try to get a master’s in nutrition or a post-bacc in dietetics, so I could become a dietitian. Being that I have a professional degree and a license, I felt somewhat uppity about having a “legitimate” degree to advise people in nutrition. But, after looking at the pre-requisite requirements, and how many classes I’d have to take during the workday (that would ALL of the classes! ), I decided to do something else. It was a tough pill to swallow; at this stage of my life, I don’t want to tell myself “no” or that it’s not possible for me to do what I want to do. But there is always plan B, and plan B is a better fit for me! I love roasted potatos, and I make 1.5lbs at a time (from a 3lb bag) so that I have potatos leftover to put in salads and eggs. Potatoes are filling, versatile, and really satisfy my gluten cravings. Roasted potatoes don’t have to be limited to a side dish! In this recipe, they are the main event! Heat oven to 400. Put potatoes, jalapenos, red pepper, and cheese on a baking sheet lined with foil. Place in the oven and cook until cheese is bubbly, about 5-8 minutes. Remove from oven. 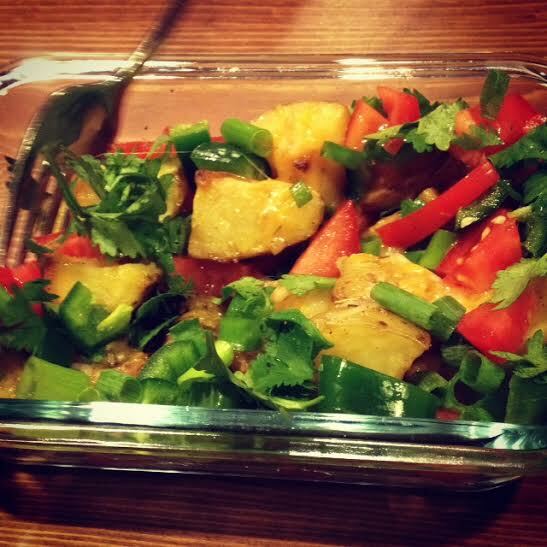 Add tomato, cilantro, and scallions over the potatoes. Squeeze lime over the potatoes. And….you’re done! Not going to lie, I have eaten an entire sheet of this!This is about 2-3 servings. I like to eat it straight from the baking sheet, but if you’re more civilized, it’s great on a plate too. This recipe would be great with pre-made bagged roasted potatoes, too! Heat oven to 400. Quarter the potatoes. Spread out on a baking sheet lined with foil. Drizzle olive oil over the potatoes. Sprinkle salt, pepper, paprika, and rosemary over the potatoes. Mix with a spoon or hands, until all potatoes are coated evenly. Bake for 25 minutes, turning halfway through. This weekend, I tried to make snacks so I would have some things to eat at work. I made those delicious hazelnut brownies again (with chopped nuts this time!!! ), and The Secret Squirrel Ginger Lemon Granola. I love the recipes on this website! They are easily low-FODMAP adaptable, and delicious! The granola calls for honey, and I subbed maple syrup. It suggests using any nuts or seeds that you’d want for the granola, so I used all low-FODMAP friendly seeds and nuts (hazelnuts, peanuts, sunflower seeds, pepitas). I had to cook mine a little longer than suggested, so I don’t think I did the Celsius to Fahrenheit conversion correctly. I also sprinkled some lemon zest over the granola right when I took it out of the oven. Mmmm, mmm! I think I’m getting the hang of this low FODMAP stuff! I feel great, and I realized I’m eating healthier than I ever have! How’s your low-FODMAP journey going this week?